KPS8M-720-36 Drive Belt. 36mm Wide x 720mm Length x 8mm Pitch. KPS II Go Kart Belt with 90 Teeth. 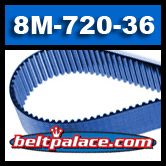 8M-720-36 Drive Belt. 36mm Wide x 720mm Length x 8mm Pitch. KPS II Go Kart Belt with 90 Teeth. This belt delivers High performance and durability. Used on industrial machinery and excellent replacement for Indoor Go-Karting drive belts. Also known as part numbers: Bando 360-8M-720, Bando 360-KPS8M-720, Gates 8MGT-720-36. Unique Blue Urethane belt body reduces wear and dust. Long lasting high modulus aramid cording. Exceptional power transmission, especially on low speed/high torque drives.